The Dialysis Pedal Exerciser is used during dialysis. Exercise therapy is recommended during dialysis because it is simple to do and has a high rate of participation according to this study done on maintenance dialysis patients. The report on the National Library of Medicine cited that the National Institutes of Health website followed patients for a 3 month period undergoing dialysis treatments 2 – 3 times a week. During this time the participants used pedal exercisers while receiving their dialysis treatment. At the end of the three month trial period the “outcome was favorable”. The results measured improved muscle strength, motor functions, and quality of life was also evaluated. As with any new exercise program it is suggested you consult with your medical practitioner first. You might also consider speaking with a person who specializes in exercise like a physiotherapist or kinesiologist. 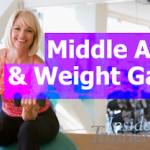 This will ensure you get the exercise program suited to your specific needs. Maintaining muscle strength is important because kidney disease makes the muscles weak. The pedalling activity during dialysis helps to ease the cramping and pain in the legs experienced during long dialysis sessions. Pedalling can help remove the waste products from the liver and muscles improving the efficiency of the dialysis. Removal of toxins from the blood. These substances include creatinine and urea and it is important to have these removed when on dialysis because the kidneys are not able to do so. It also helps to distract the patient from the time needed to complete dialysis. Most people who are otherwise healthy can also use a Stel’Air Medical Pedal Exerciser at home. 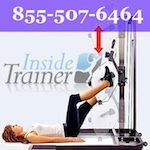 There are several accessories that can turn the pedaller into a full body exerciser. It used to be that persons with kidney disease would restrict their exercise endeavours to days between sessions. Exercising on non-dialysis days didn’t centralize on the efficiency of dialysis or toxin removal. Reduction in time available due to the demands of dialysis sessions. When a person exercises on a regular basis they see results. A person who exercises can do more, have greater stamina, more energy, and overall feel better. Exercise can help a person feel like they have better control of their lives and feel less anxious and depressed. It isn’t unusual to hear about people who no longer need to take blood pressure medication after they have started to exercise. A consistent fitness regime is a good way to control the blood pressure and help to prevent heart disease. Muscle development and flexible joints are other benefits from exercising. This will assist especially when a person is aging to help them reach, bend, maintain balance, and squat for daily bathroom functions. When a person knows their balance is good they can walk with more confidence and worry less about falling. 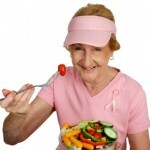 Adding a healthy diet to your fitness routine can also help reduce the overall fat and blood cholesterol. Where to Buy a Dialysis Pedaller? The Stel’Air Medical Pedaller used in the Dialysis Units can be found here. It has a smooth pedalling motion and very quiet. The tension control is magnetic so there is never any friction contact. You simply manage the tension you want by turning the tension control knob. The pedaller weighs 23 pounds so it is light enough to move it to where you want it, but heavy enough that it won’t slide around too easily. 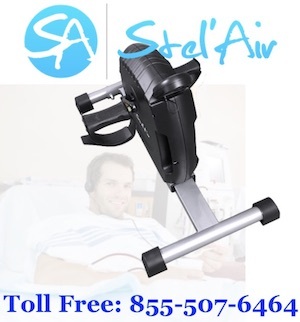 The Stel’Air Medical Pedaller used in the Renal Program and Dialysis Units is the same pedaller used in physiotherapy, rehabilitation, and assisted living centres. The Dialysis pedals are so quiet that having several people pedalling at the same time won’t be at all disruptive. After a while laying around will actually make you weaker. It doesn’t take long for muscle tissue to begin to fade away. Of course you need to check with your doctor first. 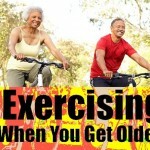 If she/he gives you the go-ahead to exercise there are simple and fun ways to get started. Something as simple as plugging in a favourite song in the player can be enough to get you grooving. Every little bit of movement is a door opening to more activity. Resting can make you more tired and exercise can make you more awake and ready to exercise even more! Not using your muscles will result in weaker muscles, less cardio so the heart will get used less, and your lungs don’t fill with oxygen. The muscles and joints can stiffen to the point of needing a walker or a cain. Being super tired when on dialysis is not unusual, but these are a few things you can do to help stay active and more energetic.